Nelson’s Monument is visible from the Isle of Wight, across the waters of the Solent. 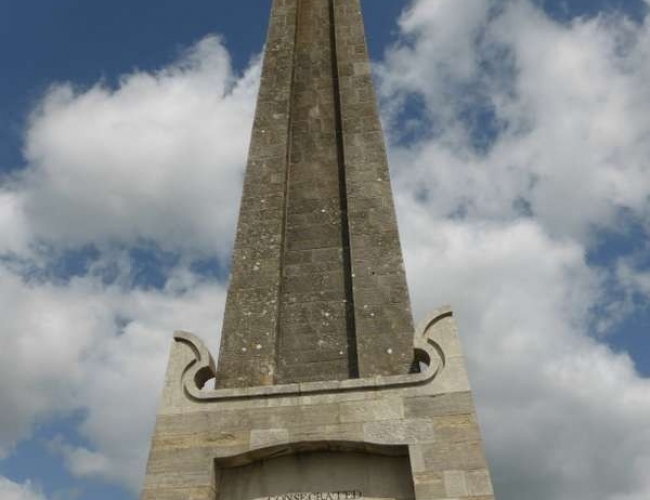 The great column, with a bust of Nelson at the top, stands 28.3m high on top of Portsdown Hill which at this point is 85m above sea level. Plaque recording the place where Nelson fell on HMS Victory. Nelson’s Jacket with musket hole. Greenwich Maritime Museum. Nelson's Column from sea-facing view. Dedication "Consecrated to the Memory of LORD VISCOUNT NELSON by the zealous attachment of all those who fought at TRAFALGAR to perpetuate his triumph and their regret MDCCCV"
one of a series of posts surrounding the Nelson monument. 2nd of posts surrounding area of Nelson's Monument Portsdown Hill with engraved anchor. Another view of post around Nelson's Monument. Vice Admiral Nelson won the hearts of the entire British population when he defeated the combined Franco – Spanish navies at the Battle of Trafalgar in 1805, when he led the Mediterranean Fleet to its victory. When was Nelson’s Monument built? The monument was built in 1807 – 1808, funded by donations of two days pay from all who served at the Battle of Trafalgar and from Royal Navy prize money. The fund of £3000, was administered by Captain Thomas Freemantle of the Royal Navy and the architect was John Groves who based the design on a 4th century obelisk in the city of Axum in Ethiopia. Nelson still commands the sea from his lofty position and even today mariners can check their positions by the monument. Nelson died at the Battle of Trafalgar on the 21st October 1805. He was hit by a musket ball through his shoulder and died on the deck of his flagship, HMS Victory, which can be visited not far away in Portsmouth Historic Dockyard. The nation mourned the loss of one of its great heroes and the Nelson Monument is a fitting tribute to him, paid by those who served with him. His body was taken to the Painted Hall at Greenwich Naval College and lay in state from the 5th – 7th January 1806 before being taken for burial to St Paul’s Cathedral. Nelson’s Monument alas had to be replaced in 1899 but the bust of Nelson, is the original one, staring out over the harbour he knew so well. The fort next door to the monument, Fort Nelson, houses a free Armoury Museum and has wonderful views over Portsmouth.